My name is Dr. Jane Ma’ati Smith C.Hyp. Msc.D. and I studied for my Bachelor of Arts degree at Arizona State University, and recieved an honorary doctorate for my lifetime contributions and achievements in the fields of spiritual counseling and metaphysics fromUniversal Life. 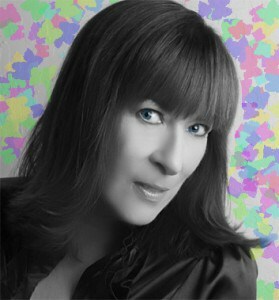 I studied hypnosis with Dr. John Kappas, and am a certified graduate of the Hypnosis Motivation Institute. I am also a Sound Energy Practitioner and a Vibrational Reiki Master. I bring to my binaural beat and isochronic tone Chakra healing programs more than 15 years of professional work in the mental health and counseling fields, helping people to help themselves, and a lifetime’s worth of in depth psychological, spiritual and Quantum knowledge. I believe spiritual balance is your birthright, and the best place to start is to actively use and direct the energy within the Chakras, and through meditation; I know what it is like to not have the time, or money, to invest in spiritual teachers, weekend workshops and retreats, or long term study courses, and that is why I devised these programs for myself and others. You probably know, your brain has two hemispheres, or sides, and that each side controls different aspects of your mind, emotions, and body; for example, the right side of your brain controls the physical actions of the left side of your body, and visa versa. 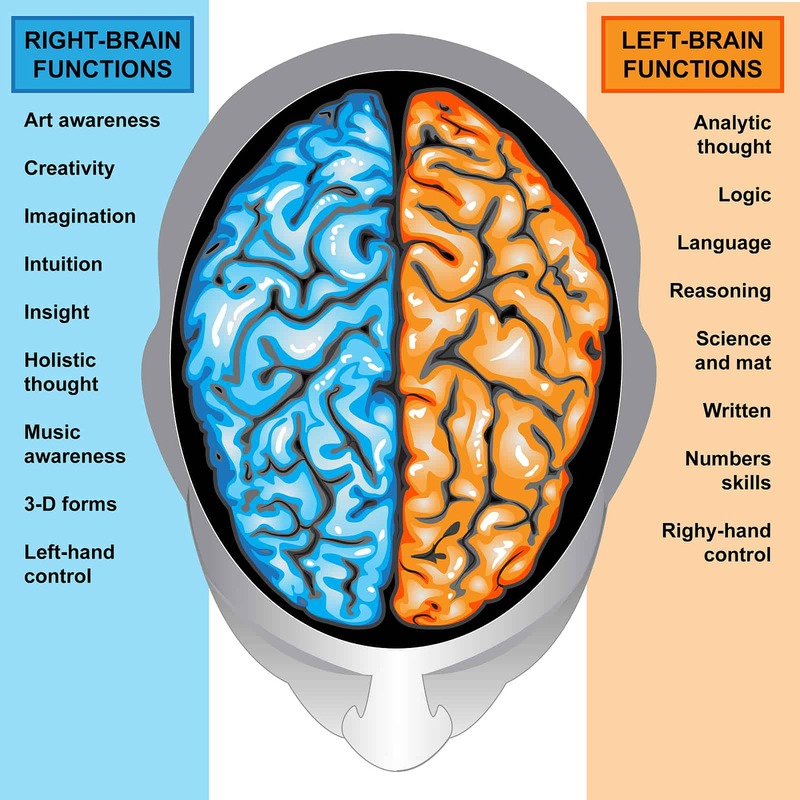 You may have also heard that “right brained” people are the creative types, artists and poets, and that “left brained” people are the logical types, like bankers and scientists. 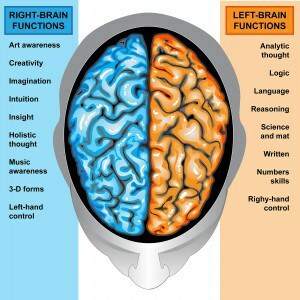 (You may also realize, that the “left brain” is the dominant force for most). Many feel that operating from a “whole brain” perspective, meaning having a balance between the feeling and the concrete forms of thinking, is the optimum balance; if, like most people, you are “left brained”, this may open up new avenues of creativity, and if you are in the “right brained” minority, it may help you to implement all those creative ideas with a concrete plan. It can take years of deep, meditative practice to achieve this whole brain state, time that most of us don’t have; binaural beats are a short cut to achieving this balanced state of mind. By playing slightly different tones into each ear, through headphones, the brainwave patterns can be gently manipulated, creating a state of deep meditation, and whole brain balance. In less than 1/2 an hour, you may find yourself achieving the same level of meditation that otherwise might take weeks, months, or even years. Our brains operate in five “states”; we generally have a mixture of various brainwaves going all the time, but one “state” will generally be dominant. 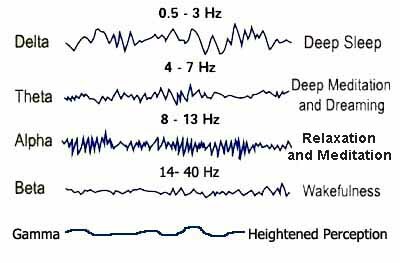 (It may be when you feel “scrambled”, that your are experiencing a “scrambled” variety of brainwaves; another advantage of binaural beats could be, “straightening your head out”). Gamma has the highest frequency 40 Hz and above. Advanced meditation and yoga practices associate the Gamma brainwave frequency with a state of pure compassion. Researchers have also discovered that the Gamma brainwave range is associated with a heightened sense of perception, mood and information processing. Beta has the next highest frequency, between 13 and 40 Hz. This is associated with our normal, everyday waking state. Beta helps in logical thinking, analysis, and active attention. Stress can throw the frequency to the higher ranges of beta. Alpha operates between 8 and 13 Hz. This occurs during daydreaming, fantasizing and creative visualization. This is often associated with a deeply relaxed state, and with a light trance or meditation. Theta operates between 4 and 8 Hz. Theta is associated with intuition, and allows us to access our subconscious. It is activated during dream sleep and deep meditational states. Theta is also associated with creative thinking, and allows us to tap into our inner genius. Delta has the lowest frequency between 0.5 and 4 Hz. Delta is produced during deep sleep. Isochronic tones are regular, metered pulses of sound, which, like binaural beats, can work to “entrain” the brain into a desired level of meditation. Unlike binaral beats, isochronic tones do not need headphones; we use isochronic tones primarily on our videos and DVDs. The tone can often be heard as a sort of “helicopter” noise. The binaural beat brainwave entrainment used in our Chakra Healing MP3s follow the Schumann Resonance; the Schumann Resonance is the electro-magnetic heart beat of our Mother Earth, and a frequency we have evolved, over millions of years, to be in tune with. Progressing the binaural beats, and your brainwaves, along the Schumann Resonances can have a profoundly calming and balancing effect. The Solfeggio frequencies are the original musical scale used in Gregorian chants, such as the great hymn to St. John the Baptist. These ancient Christian chants, and their special spiritual overtones, were believed to infuse great spiritual blessings and transformation, when sung in harmony. In an “East meets West” coincidence, these Solfeggio frequencies correspond to the Chakra frequencies, with the 7th Chakra vibrating at 963 Hz. We use these Chakra balancing Solfeggio frequencies as the binaural beats and isochronic tones, to help heal body, mind and soul. Tibetan Singing Bowls are used for meditation, inducing trance, and prayer. 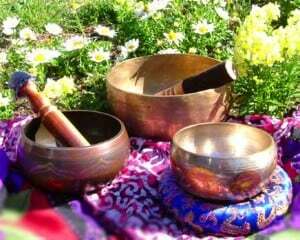 I primarily use Chakra balancing Tibetan Singing Bowls, along with the Solfeggio binaural beats and isochronic tones, to produce the transformative Chakra healing sounds used in my Chakra meditation CDs, MP3s and videos. The organic and otherworldly sounds are unrivaled for inducing a trance state, and by using Tibetan Singing Bowls that are attuned to the various Chakras, near magical transformations body, mind and soul can be achieved. I hope this answers any questions you might have! If it didn’t, please feel free to contact us!